Performing and music have always been the focus of Aaron’s work. Aaron had worked as a Music Composer, Producer and Audio Engineer for various Music and TV productions including many years writing for Lonely Planet. The storytelling style of their EP Crazy as well as male and female vocals with strong guitar accompaniment is a timeless combination – The pair combines effortlessly, their voices as one, complimenting each other over D’Arcy’s guitar, pulling off the necessary country lament while keeping to the melodic hookiness vital to good pop music. Crazy sees them pull this together nicely, the results strong and confident, while retaining a playfulness often missing in music today. Their first single, ‘You’ll Be With Me Till I Die,’ heralds the arrival of a smart, new brand of country pop music, its bouncy acoustic guitar riff and soaring vocals reminiscent of any number of Nashville bars scattered along the fabled Music Row, pedal steel sliding in and out in the background, xylophone tinkles adding a sprightly edge to create an instant foot-tapper. 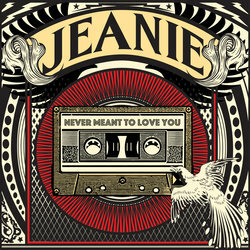 Jeanie has joined forces with Aleyce Simmonds again on 'Never Meant To Love You' - this time with her singing the backing vocals. The single was written by one of Aaron's favourite songwriters, Corey Chisel and is always a crowd favourite at gigs.